Peyton Manning’s legacy. It’s undeniable; it’s on everyone’s mind. What will Peyton Manning’s legacy be after this game? Some will be ready to crown him the best quarterback ever if he wins, others will be ready to destroy him should he lose. Of course, judging such things on one game, in such a team heavy sport is ridiculous. However, we know mainstream media will have the hot takes all cued up for post-game reports. The result will be huge in how people chose to view Peyton Manning, regardless of whether that is fair or not. Defense against offense. Its not often we get to watch the undisputed best offense and defense match up in such a big game. We will on Sunday. Russell Wilson’s play. The second year passer has not been effective for the majority of the playoffs. He is bailing on plays too soon and seems to generally lack confidence. If the Broncos are going to put up an onslaught of points, the Seahawks will need better from Wilson. Coaching redemption. Both Pete Carroll and John Fox have reinvented themselves in their newest NFL homes. No matter who wins, it will be an impressive chapter in either’s coaching redemption story. Inexperience everywhere. The Seahawks have exactly zero players who have been to a Super Bowl. John Fox and Peyton Manning highlight a short list of Broncos with any experience there. The Broncos have a slightly more veteran feel to them, but they have plenty of green, young players too. Everyone knows Marshawn Lynch is the foundation of the Seahawks offense; now more so than ever with Russell Wilson’s recent struggles. Lynch carried the offense against the Saints, and broke things open with his long touchdown against the 49ers. The Patriots tried to establish their power running game early on during their loss to the Broncos. Here, the Patriots bring the tight end to seal Shaun Phillips on the edge. 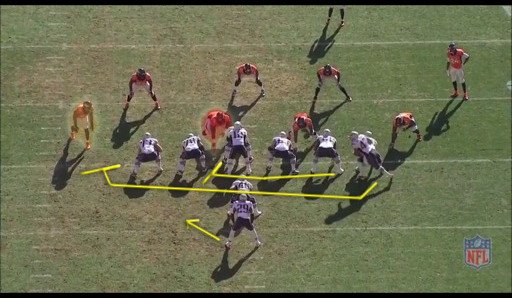 New England also pulls their right tackle in order to get some favorable blocking for LeGarrette Blount. It is a well-designed downhill running play. Terrance Knighton’s great play has been the catalyst for other members of the Broncos front seven. On this play, Knighton (highlighted in red) blows past his first blocker with an overarm move. The center never gets his hands on him, and Pot Roast is already in the backfield. Everyone knows Knighton is a big man, but his quickness and athleticism is underrated. It’s probably the biggest reason he blows up running plays like this. The Broncos, and their monstrous defensive tackle, have been feasting on primarily power, man-blocking schemes in the playoffs. Marshawn Lynch is regarded as a power back, but he is far more versatile than that. 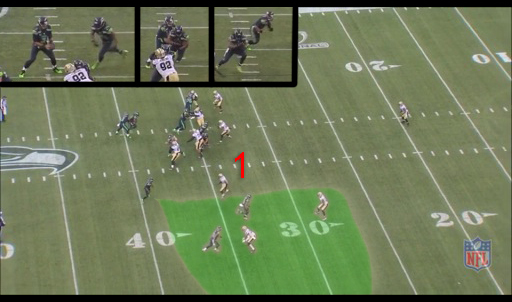 The Seahawks like to run a lot of zone blocking, and cut backs to take advantage of his quick feet. It is certainly worth watching whether those stylistic differences help neutralize Terrance Knighton’s penetration. Lynch succeeded against plenty of muddled backfield against the Saints. The best set of receivers against the premier secondary in the NFL. It’s a natural matchup to highlight. Both sides will experience something they have yet to combat this season. The Broncos receivers have yet to face a big, imposing secondary like the Seahawks. Yet, Seattle’s corners have yet to be tested by such a deep receiver group, like the Denver corps. 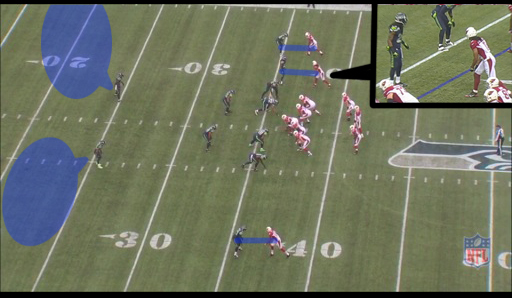 For the most part, this play is pretty typical of what the Seahawks do on defense. The outside corners are in press-man coverage, while the safeties are roaming deep. The interesting wrinkle comes in the slot position. Richard Sherman, the best corner in the league, is not often used as a shadow on the opposition’s best receiver. However, if there is a threat great enough to draw Seattle’s respect, the proposition isn’t out of the question. 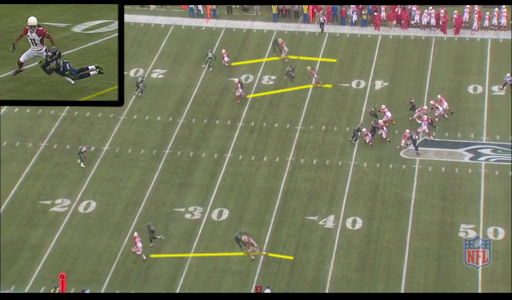 On this play, Sherman plays inside the formation to cover Larry Fitzgerald in the slot. The outside corners both get physical with their receivers, and jam them at the line. However, Sherman plays off man on Fitzgerald. He can really shine in this setting. Sherman uses his intelligence and knowledge of receiver’s routes to gain great leverage on Fitzgerald. Carson Palmer chooses to throw to the unjammed Fitzgerald, and Sherman makes him pay. He lunges inside to intercept the pass. Against the Broncos, Demaryius Thomas is certainly the best of their deep receiver group. It will be interesting to see if Seattle chooses to mix up their coverage schemes against Denver. The smart money is to bet they just play them straight up. The Seahawks might actually have a nice advantage here. If they can win the physical battle with Denver’s receivers, that will disrupt Peyton Manning’s timing. A reciprocal relationship exists between this match up and the last one. If the Seahawks secondary can hold their coverage longer, the pass rusher will have more time to get to Manning. They might just need it, because the Broncos offensive line is on fire. 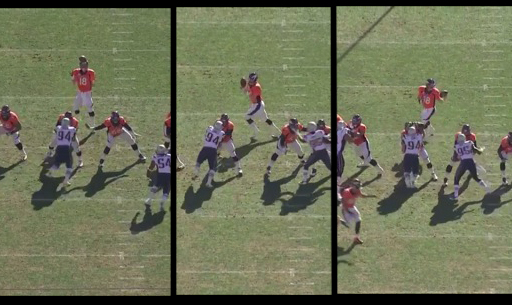 The Broncos line holds the pocket during Manning’s juggle, and then some. 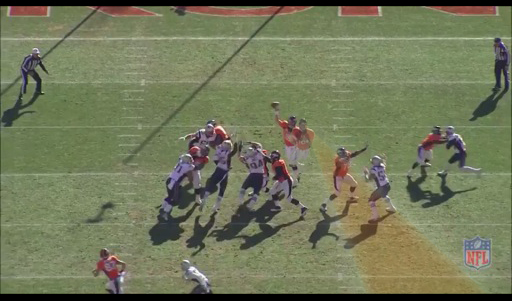 Peyton still has time to read two areas of the field, before firing the ball to Eric Decker. The Patriots waste a perfect opportunity; because they could to get any pressure. Of course, the Seahawks pass rushers present a much greater challenge. Michael Bennett headlines a deep group of linemen that excel at getting interior pressure. Players like Bennett, Brandon Mebane, and Clinton McDonald could be big factors. The Seahawks would be wise to adopt the Patriots strategy. 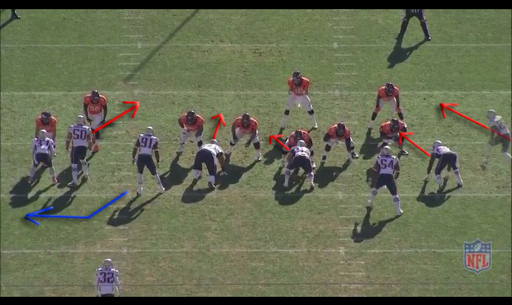 Usually it isn’t wise to bring an extra rusher against Manning, because he can diagnose things so quickly. However, since Seattle has such a great secondary, they might be able to get away with it. A fifth rusher such as Bruce Irvin, would go along way to besting an offensive line that is playing very well. This is by far the most exciting look the Seahawks can deploy with Harvin on the field. The play comes right out of the Chip Kelly playbook, and it puts a ton of stress on the defense. The quarterback has at least three options post snap. 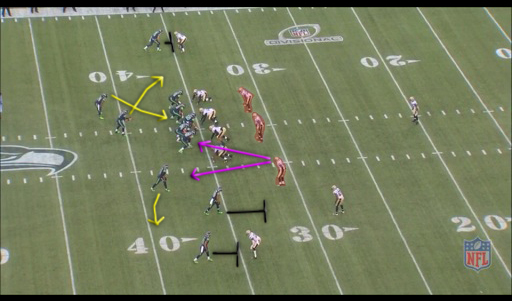 Wilson can hand off to Lynch, keep it himself, or turn and throw the ball to Harvin on a little bubble screen. The three defenders—highlighted in red—have to watch out for three things. The safety over Harvin is especially overworked. He must keep one eye on Harvin while also watching the backfield. Wilson elects to hand the ball off to Lynch, because the offensive line opens up a few holes. However, imagine if he threw the screen to Harvin. Due to the stress of the read option, Harvin only has the one defender guarding him. That safety is also not in an ideal position to make the quick stop. The odds Percy Harvin eludes that tackle are very high. If he does, he has a lot of green space to work with, provided the receivers execute their blocks effectively. A lot of that analysis was pure projection, but that’s all we can do with Harvin right now. If he can bring this extra dimension to the Seahawks offense for twenty-five or more snaps a game, it could mean at least one more additional score. All week I was ready to take the Broncos, but after writing up these match ups I nearly convinced myself to change my pick. Still, I am sticking with Denver. I don’t have a great reason, but just feel Peyton Manning will be dialed in. Enjoy a great game either way!